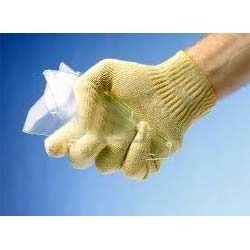 We offer our client a wide range of Safety Hand Gloves that are made with sweat absorbent material. These products are designed and developed by making use of optimum grade material and with the assistance of innovative machines. These products are available in multitude of sizes, colours, cut and designs, and offer protection to the wearers' hands. Our assortment is customized as per patron’s requirements to provide best possible contentment. We provide these products at industry leading prices. Incepted in the year 2012, at Gurgaon (Haryana, India), we “R K Traders” are acknowledged as a leading Trader, Wholesaler and Supplier of an excellent quality range of Industrial and Chemical Safety Items, ESD Product, Welding Machines And Accessories, Hardware Items And Tools, Industrial products Wipes, Derlin Block, PVC Insulation Tape, Nylon Cable Tie,Panduit and Hellermann Cable Tie and Gun, Kilwes /Techno Spring balancer, Magnets, HIOKI, Aplab, Falcon, Testing & Measuring Instruments- Mitutoyo, Insize, Atul and Bradma Punches, Liquid Nitrogen Container (IBP) , Kluber Grease, Pneumatic and Hydraulic Fitting, Hose Pipe - Dunlop, PVC Insulation Tape, Electrical Cables, PVC, Transparent Rubber sheet etc. We have established our business as Sole Proprietorship firm in this domain by offering high quality product range. We source these products from most trusted vendors of the market. In order to design and assemble these products in adherence with laid industry standards, our vendors use finest quality basic components and ultramodern technology. The offered products are widely demanded in the market for features like high strength, easy operation, less maintenance, longer service life and durability. We offer these products in diverse specifications at the most in expensive rate in accordance with the needs of customers.